A properly formatted debt settlement letter can help settle a delinquent account, whether you are a creditor or a consumer. Use one of the customizable templates here as a starting point for drafting a letter to send to your credit card company. See these tips for PDF printables if you need assistance. Creditors often reach out to the debtor in writing in an attempt to collect some portion of the debt that they are owed. If you need to send a letter offering a settlement in an attempt to a collect an outstanding debt from a consumer, this sample letter is a good place to start. It is important to note that letters from creditors must contain the following statement: "This is an attempt to collect a debt. Any information obtained will be used for that purpose." In addition, the letter you send should include your firm's office hours, phone number, and payment remittance information. If you owe money and are hoping to reach a settlement agreement with the creditor, use this template to help you start writing. It is a sample letter from a consumer requesting their debt be settled for a specified amount lower than the current balance. This type of letter is generally used to to negotiate a lower balance or arrange some sort of payment plan. They typically notify the creditor about their current financial situation and how much they can afford in payments in an effort to reach an agreement that lowers the delinquent balance and minimizes damage done to the credit file. When negotiating with creditors in writing, only propose an amount that is actually feasible for your situation in case it is accepted. Be cautious with the content of your letter since it can be used against you in court. 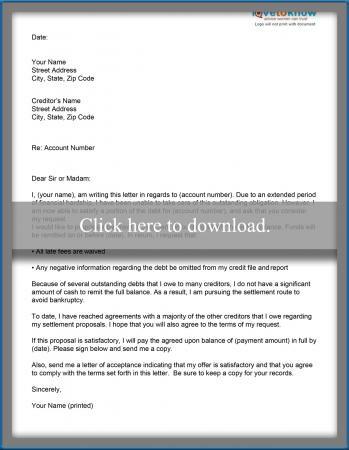 CuraDebt, another debt settlement company, has images of over 75 actual settlement letters on its website. Information about the client and recipient is removed, but the remainder of the text is intact. 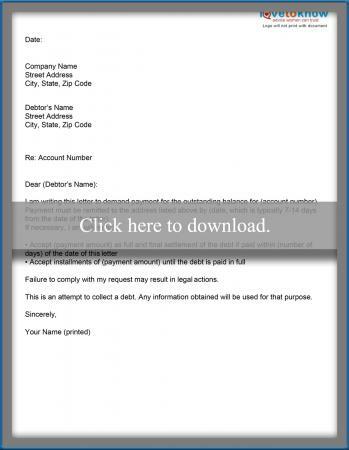 DocStoc contains a sample settlement letter written from the point of view of the consumer. It lists conditions that can pertain to settlement agreements, such as expunging negative credit report listings and canceling pending litigation. Some lawyers will advise clients to send this sort of letter in response to a letter from a creditor. To learn more about the Fair Debt Collection Practices Act, visit the Federal Trade Commission website. 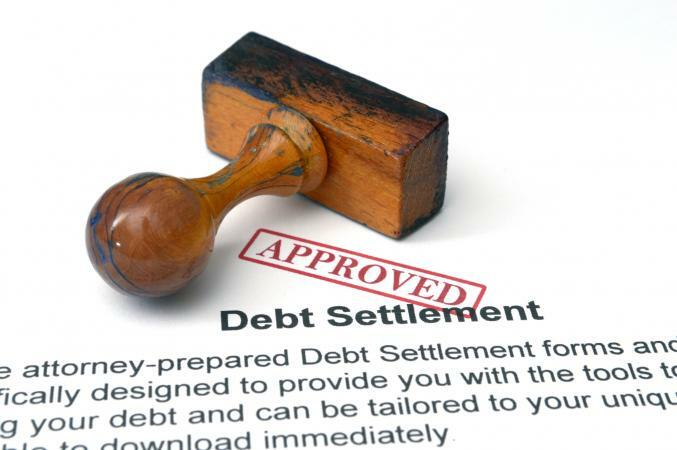 Debt settlement letters provide proof of communication between debtors and creditors during the negotiation process. Be sure your letter includes the current date, contact information for the sender and recipient, details on the balance owed, and specifics of the proposed settlement. It is also important to specify when the payment is due (or will be made) and any applicable deadlines.